Do you remember when eating raw eggs was the popular way for bodybuilders to get their shot of protein? It’s a good thing this “fad” isn’t much of a thing anymore: from 1985–2002, eggs were responsible for an estimated 53 percent of all Salmonella food-borne illness cases in the U.S. Even today, Salmonella is the most common cause of food-borne illnesses in the U.S. and is often spread by poultry and poultry products (like eggs). Beyond the risk of contracting a food-borne illness, there is no nutritional benefit to eating raw eggs over cooked eggs. Cooked eggs still have plenty of protein, healthy fats, and the vitamins that are essential for your child’s growth and development. In fact, cooked eggs are an excellent source of high-quality protein for little ones. The benefits and risks associated with consuming raw or undercooked eggs are fairly one-sided. It is important to understand that although not every egg that you buy in the grocery store or farmer’s market is contaminated with Salmonella, consuming undercooked or raw eggs means you are potentially subjecting yourself or your family to unnecessary risk for becoming ill (possibly very ill). Symptoms of Salmonella include vomiting and diarrhea, cramps, fever, and headache. 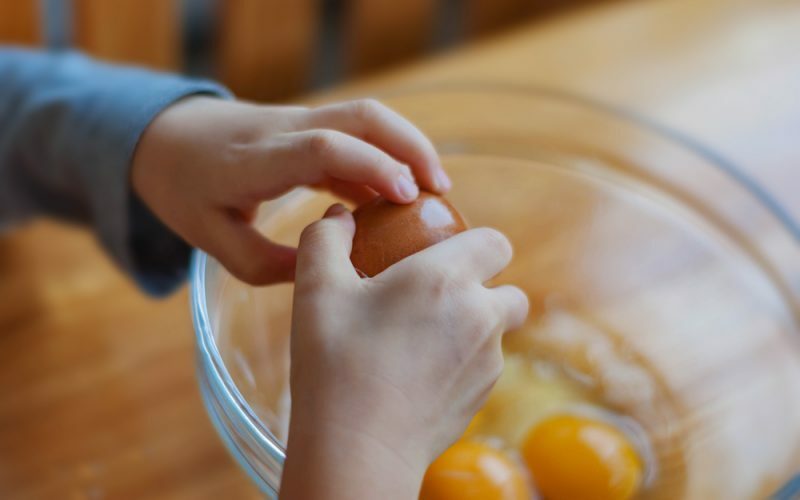 Feeding your child undercooked or raw eggs may expose your child to unnecessary risk for becoming ill, especially if your child is immune-compromised or under 5 years of age. Overall, it’s safer to only feed your child well-cooked eggs. Salmonella infection can be dangerous, particularly in small children, and can be detrimental to both your child’s and your quality of life. Raw eggs can carry Salmonella. There is no nutritional advantage to eating raw eggs over cooked eggs. Cooked eggs are a good source of protein. Whiley H, Ross K. Salmonella and Eggs: From Production to Plate. Tchounwou PB, ed. International Journal of Environmental Research and Public Health. 2015;12(3):2543-2556.